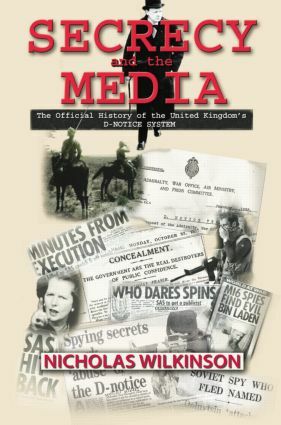 Secrecy and the Media is the first book to examine the development of the D-Notice system, which regulates the UK media's publication of British national security secrets. It is based on official documents, many of which have not previously been available to a general audience, as well as on media sources. From Victorian times, British governments have consistently seen the need, in the public interest, to prevent the media publishing secret information which would endanger national security. The UK media have meanwhile continuously resisted official attempts to impose any form of censorship, arguing that a free press is in the public interest. Both sides have normally seen the pitfalls of attempting to resolve this sometimes acrimonious conflict of interests by litigation, and have together evolved a system of editorial self-regulation, assisted by day-to-day independent expert advice, known colloquially as the D-Notice System. The book traces the development of this system from nineteenth-century colonial campaigns, through two world wars, to modern operations and counter-terrorism in the post-Cold War era, up to the beginning of the Labour government in 1997. Examples are drawn from media, political and official sources (some not yet open), and cover not only defence issues (including Special Forces), but also the activities of the secret intelligence services MI5, MI6 and GCHQ. These cases relate principally to the UK, but also to American and other allies’ interests. The story of how this sometimes controversial institution now operates in the modern world will be essential reading for those in the media and government departments, and for academics and students in the fields of security, defence and intelligence, as well as being an accessible exposé for the general reader. Nicholas Wilkinson served in the Royal Navy 1959-98, and from 1999 to 2004 he ran the independent Defence, Press and Broadcasting Advisory Committee. He was a Press Complaints Commissioner from 2005 to 2008, and is a Cabinet Office Historian.